This recognition is one of the final pieces of the puzzle that is to become the first five-country UNESCO Biosphere Reserve in the world. Once Austria a positive response from UNESCO for their proposal of Biosphere Reserve “Lower Mura Valley”, all preconditions will be fulfilled for a five-country nomination. VELIKA POLANA, SLOVENIA – Sixteen Slovenian municipalities were awarded the UNESCO Certificate for the Mura Biosphere Reserve. Slovenian Minister of the Environment and Spatial Planning Jure Leben presented the certificates to municipalities together with Miguel Clüsener-Godt, director of the Division for Ecological and Earth Sciences at UNESCO, on a ceremony organized in Velika Polana. On this occasion, Minister Leben reaffirmed his pledge to prevent new hydropower plants on the Mura River in an effort to preserve the remaining natural parts of the Mura River for future generations. It was truly a day of celebration for the local communities along the Mura and for the river itself. 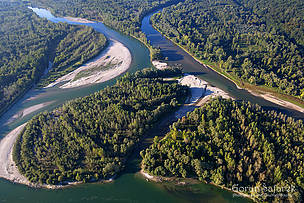 In the spirit of celebration, WWF congratulates all municipalities, Slovenian institutions and Government for their success and promise of preserving one of the most beautiful rivers in Europe, an integral part of the Amazon of Europe and the future five-country Biosphere Reserve “Mura-Drava-Danube”!